China's military ranked as the most powerful in Asia, with eight other on the continent in the top 20: Japan, South Korea, Pakistan, Indonesia, Vietnam, Taiwan and Thailand. The cited index examined 133 countries. The Global Firepower Military Strength Index measures the countries’ military strength based on 50 parameters, including military resources, diversity of weapon systems, natural resources, industry and geographical features and available manpower. 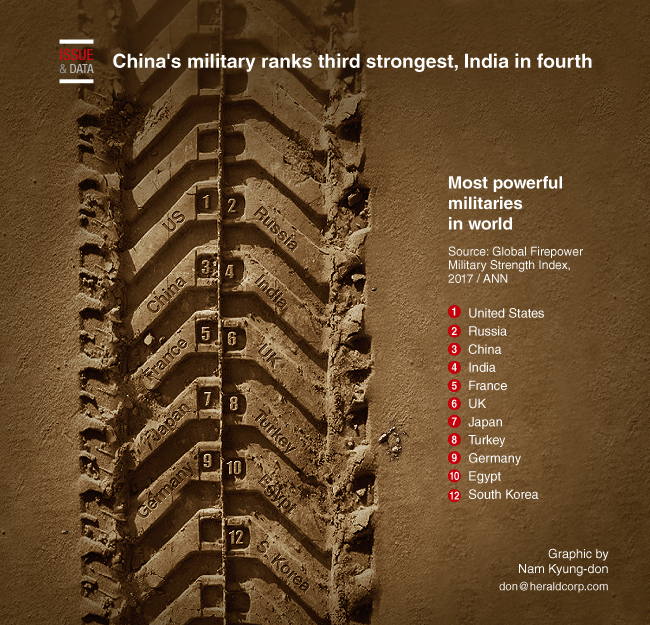 China's armed forces have been ranked No. 3 based on their capability on land, sea and air, as well as their financial dexterity and diversity in weapon systems. It has more aircraft and naval ships than Russia, but is hugely outnumbered in total tanks in service. South Korea has ranked 12th in the world. The country has faced potential threats of aggression from North Korea and has been increasing its military strength on various fronts.